Want to lead others to behavior change? Don’t tell them to “Go fish!”… After all, who wants to listen to and obey a “command and control” dictator? Don’t teach them how to fish…. You might be able to listen and engage but it will be hit or miss to motivate someone to take action. 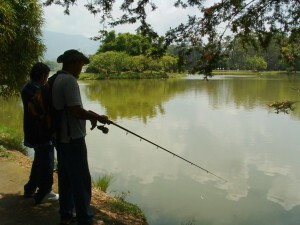 Instead, help them get their own insights about the act of fishing…. They’ll learn more with better recall, become more engaged, and be more inspired to act. Authors Josh Davis, Christine Chesebrough, David Rock and Christine Cox reviewed all of the latest research about self-generated insight for the article. They are convinced that insights that individuals get on their own may be one of the more useful tools to change behavior. As a consultant and coach, I concur based on my personal and client experiences over the years. From a neuroscience perspective, when people experience an epiphany or “aha” idea on their own, they systematically make new connections in their brain. These connections change the brain immediately and in the future. As a result, people literally think differently after having a self-generated insight. More importantly from a change perspective, they’re also more compelled to take actions on their own or with the help of some nudges. Leaders who recognize the power of this approach and support others in getting insights have an advantage. They can earn greater respect from the people they work with. Plus the good ideas that people come up with and the actions they take can increase innovation, improve productivity and strengthen stakeholder relationships. Granted, this involves leaders working in a very different way, probably outside of their comfort zone for many. Rather than be the expert in the room, they need to become the guide by the side. Stimulating insights in others requires you to “inquire and retire”—as I’ve dubbed it. Inquire means you’ve got to stop talking at them and start asking questions, particularly thinking questions. Thinking questions are designed to help an individual stop, reflect and focus on the quality of the thinking he or she has devoted to the topic to date. As I’ve learned in my NeuroLeadership training, thinking questions help individuals slow down, quiet their brain and become more self-aware. By doing so, they also make connections and take more responsibility for their thoughts and actions, including deciding what will be best for them to do next. You then need to retire. The word “retire” serves two purposes. First “retire” rhymes with “inquire” which makes the phrase “inquire and retire” easier to remember. Second, “retire” punctuates the point that you need to pull back and give individuals time and space to generate their own insights. The amount of time it takes for someone to generate an insight can vary dramatically by person and by situation. As a rule of thumb though, keep in mind that fewer than 10% of people report getting their best ideas at work, according to the NeuroLeadership Institute’s CEO David Rock. (See his statistics in the Wall Street Journal article The Inner Workings of the Executive Brain.) And that may be true for insights as well—considering that the office environment is full of distractions. Leaders who truly support stimulating people to generate their own insights will need to take workplace flexibility to new levels. This flexibility can contribute to greater effectiveness and sustained change, which in today’s knowledge economy is more valuable than traditional efficiency. As a progressive leader, to what extent can you talk less, question more and give people time and space to think for themselves so they can get “aha!” moments to lead to behavior change? How true it is that some of our best “aha” moments don’t come to us at work or in overly structured environments. Excellent article. Thanks, Mona! Sometimes it amazes me that we actually get work done at work, considering how many office settings and other work environments tend to hinder rather than help our brains perform at their best. Can you imagine what we could do if we were working in optimal conditions?